Major Hurricane US Strikes Over Past 57 Years Plummet, Far Below That Of 60 To 120 Years Ago! Browse: Home / 2017 / August / 27 / Major Hurricane US Strikes Over Past 57 Years Plummet, Far Below That Of 60 To 120 Years Ago! 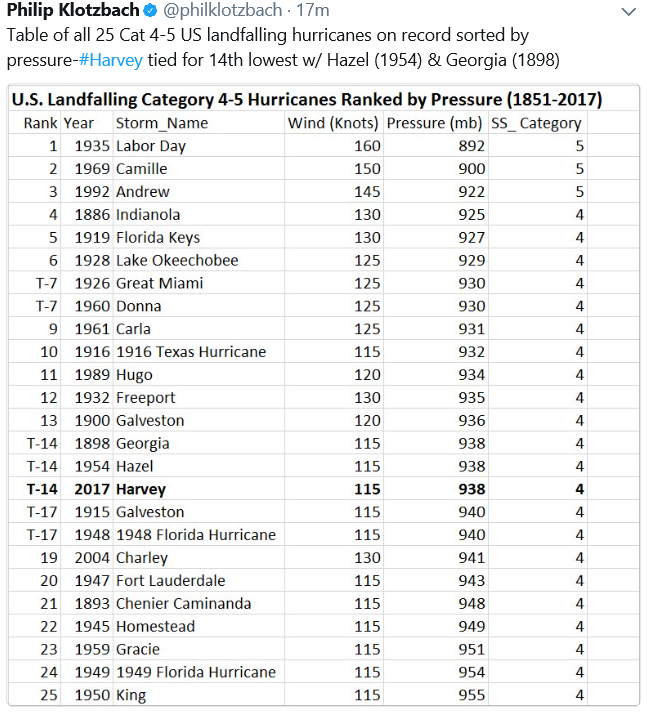 At Twitter here hurricane expert Philip Klotzbach has posted some interesting historical data on hurricanes amid all the new hype surrounding Category 4 hurricane Harvey. The following is a table of all the Category 4 or 5 hurricanes that have hit the US, 25 in all, since records began. Note: Hurricane Katrina in 2005 was only a Category 3 hurricane when it hit land, and so is not on the above list, which lists only Category 4 and 5 hurricanes. Not surprisingly some global warming alarmists have been insisting that major hurricanes have gotten more intense and more frequent in response to man warming the globe. The first 60 years of the 20th century (1901 – 1960) saw a total of 15 major hurricanes strikes. The next 57 years, until today, have seen only 6! That behavior contradicts the global warming/increased major hurricanes claim. 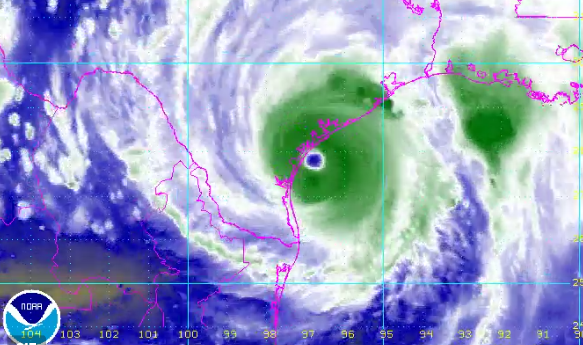 Im any hypothesis can be drawn, it is that higher CO2 and global warming lead to less major hurricane strike. But that’s not what the alarmists want you to believe. At his Saturday Summary here, Bastardi shows a number of examples of past storms behaving peculiarly, reminding viewers it’s all natural and happened before with CO2 below 350 ppm – level some claim will bring back calmer weather. The Category 4 Harvey hurricane striking Texas ended the USA’s record long major (Category 3+) hurricane landfall drought of 4323 days. I cannot see Katrina (902 mb) in your list of intense hurricanes. What else may be missing? It was Cat 3 when making landfall. This report looks at Cat 4 & 5. Oh I´m sorry. my bad…. ???? That measurement was by a hurricane hunter over open water. It weakened significantly before it hit land. Also, the eye went ashore in Gulfport-Biloxi Mississippi area. New Orleans never experienced hurricane force winds winds as you can verify with NOAA records. What happened in NOLA is that the storm surge rotated into Lake Pontchartrain, and the wave action undermined levees that were improperly built because of levee board fraud. Where is Katrina on the list? Since you’re the second person to bring this up, I’ve added a note under the table. It is not your fault if Ian McWilliam and Bojangles have severe reading/comprehension problems. The eye of Katrina passed about 40km east of New Orleans, so the city experienced at most Cat 1 winds. The killer was Lake Pontchartrain storm surge overtopping levies that the city had corruptly failed to maintain. Once breached, much of the city was flooded as it lies below sea level due to subsidence. The place to look out for is Galveston TX. The 1915 Galveston hurricane was a deadly hurricane that struck Leeward Islands, Hispaniola, Cuba and Texas, in mid August of the 1915 Atlantic hurricane season. Striking Galveston, Texas, 15 years after the 1900 Galveston Hurricane, its 21-ft (6.4-m) waves were slowed by the new Galveston Seawall but changed the beach structure: on August 17, the entire 300-ft (91.5–m) beach was eroded to become an offshore sandbar, later returning partially, but never the same. The 1915 storm caused a great deal of destruction in its path, leaving 275-400 people dead and $50 million (1915 USD, $921 million 2005 USD) in damage. Arguing using factual information is no longer valid. I’m giving two links, the original and one about it, because I don’t know how long the original will last. There was an awful lot of disinformation, much of which is still circulating as “fact,” even by people who should know better. I had someone suggest that it’s not the frequency or the strength of the hurricanes that’s from climate change, but the movement. So Harvey sat over Texas for a while instead of moving on. Is this due to climate change? And why would Harvey sit and stay …and Irma kept on moving? Tracy, it was TWO High Pressure cells that created a TROUGH for the Hurricane to move very slowly in. You’re absolutely correct, Tracy. CO2 causes the air to thicken in some places and thin in others. It’s the change in the viscosity of the air that affects their movement, and if we aren’t careful, some things will come to a complete halt, while others will spin out of control. BTW, that “someone” wasn’t some guy you met in a bar in Coconut Grove, by any chance, was it? OK, seriously, maybe this analogy can help you understand the human contribution to CO2. It’s just not enough to cause any problems.